Once again, the dark clouds opened up and the sun poked through the dense early-morning fog, across the lake at Campbell County Park, and the rains stopped, and 130-plus golfers enjoyed coffee and donuts and teed off simultaneously at 9:00am on September 28 to compete for having the best time at the Annual Mentoring Plus golf outing at A.J. Jolly Golf Course. After a week of rain, it was fitting to have a beautiful day where almost 200 people opened their hearts and wallets to support the disadvantaged teenagers who call Mentoring Plus their alternative family. It was also fitting that the winning team at 14 under par was a “ladies team” comprised of three women, Blaise Prost, Sarah Braun and Mary Watts and one gentleman, Irv Watts. Two “men’s teams” tied for second at 13 under, and Joe and Gary Devoto’s team got the prize (a dozen Mentoring Plus good golf balls) via a card playoff. Blaise also won the ladies’ longest drive contest, and Sarah won closest to the pin. Real golfers, I suppose. Wayne Berryman won the men’s closest to the pin (on #8), and Brook Reeves won the men’s long drive on 11. All the winners were eligible to win the brand new Chevy Camaro convertible from Kelsey Chevrolet (for a weekend) and Danielle pulled Wayne Berryman’s name out of the hat! There were two skins for the day (lowest score on a hole not matched by any other team) and both were worth over $300. One was won by Anthony Laup and his wife, Leslie, along with Ryan Turner and Adrian Cabrera. I believe it was a Birdie on the difficult par 3, #6, and the other was an Eagle on #18 by Skip Hicks, Milt Horner, Charlie Barr and Paul Winkler. The asterisk to that is that we sold “skirts” this year instead of mulligans, meaning that for $10 a man could tee off from the ladies’ tee, a sizable yardage advantage, and Milt Horner drove the green (from across the pond) and made a 30-foot putt for an Eagle 2. Board Co-chair Ed Muntel (retired CEO of NorthKey Community Care) grilled hot dogs for lunch with Executive Director Chris Saunders and former ED Kevin Kennedy (retired supervisor for the Department of Juvenile Justice), with the help of volunteers like Joe Kling. There was an unlimited supply of beer, soft drinks and water to quench any thirst on the unusually hot, 85-degree day. Texas Roadhouse again donated a wonderful barbeque and chicken dinner, and there were over 120 raffle prizes distributed to the golfers. Helping draw the raffle prize winners was M+ Alumnus, Danielle, who accepted the microphone and silenced the enthusiastic crowd with her powerful story of her unfortunate adolescence, including having two children before the age of 16. She captivated the audience with her sincere appreciation for her non-judgmental “family” at Mentoring Plus, who gave her the new confidence she needed to secure a job and to find a place to live. Just like Mentoring Plus. Lucked out with a beautiful day, and lucked out with a $20,000 financial gain to support the program (for at least another month). So, thank you to all who participated and helped to keep us moving along, especially our VIP Sponsors Texas Roadhouse and Hosea Project Movers, our Gold Sponsors like The Berger Law Firm and Cincinnati United Contractors, and our Silver Sponsors like Desmond Bros Insurance, Danis Construction, Champlin Architecture, Spiff Contracting and JD Distributors, and the hole sponsors: Riggs Hearing & Vision; Dobbling, Muehlenkamp & Erschell Funeral Homes; Dickey’s Glass; Fessler, Schneider & Grimme attorneys; County Attorney Steve Franzen; attorney Paul Hill and realtor Jennifer Hill; attorney Dean Pisacano; Judge Dawn Gentry; Judicial candidate Derek Durbin; Commonwealth Attorney candidate Justin Fortner; Benton, Benton & Luedeke attorneys; Jolly Plumbing; Oswald; Schoepf and Associates; and API Printing. See you next year on September 27, 2019! https://mentoringplus.org/wp-content/uploads/2018/09/shopping-bags-500x500.png 416 500 randerson http://mentoringplus.bitsdesigns-projects.com/wp-content/uploads/2017/02/Mentoring-Plus-logo-Final.png randerson2018-07-04 17:42:222018-09-04 18:46:31Support Us When You Shop! The future of social work is looking brighter, thanks to the students at Northern Kentucky University. This holiday season, Northern Kentucky area non-profits received thousands of dollars that were raised by students at NKU. From social work to marketing, students from across the campus ran various campaigns to support the local community, help those who are in need, and promote the non-profit organizations that serve the most disadvantaged people in the region. That group went on to raise $2000, donating half of those funds to Mentoring Plus in the form of the Mayerson Grant. Additionally, David Raska, a marketing professor at Northern, challenged ten of his students to raise as much as they could for Mentoring plus for #GivingTuesday, with the promise that he would match their donation up to $1000. Student Haley Payne organized a GoFundMe page in the final days before #GivingTuesday, raising $575. Raska’s match brought their total to $1150. But they didn’t stop there. Earlier in the year during the Spring semester, those same marketing students worked on a project for Kona Ice. After completing the project, the students were invited to the Kona Ice Konvention, and were awarded $2000. Going into the giving season, the group still had $1700 remaining, and elected to add that to their #GivingTuesday contribution, bringing their new total to $2850. All-in-all, NKU contributed nearly $4000 to Mentoring Plus is just a matter of weeks. We wish to thank them for their continuous efforts to improve the Northern Kentucky community. We are especially grateful that they have recognized Mentoring Plus as the recipient of these funds, allowing us to continue our mission. So often, when we tell people about Mentoring Plus, it can be difficult to briefly describe just what it is that we do here. The truth is that our services are so broad and have such depth that summing it up into a few sentences can be a challenge. Yet, the impact that we’re seeing on the lives of the teens and families we serve is immense, and we can hardly keep ourselves from spreading the good news. That’s why our #GivingTuesday Open House has become so important. Nothing that a volunteer or staff member can say will adequately capture the importance of our work to those who are served. Opening our doors to the public; allowing people to see, first-hand, what we do and how we do it has a way of bringing the program to life in a way that words alone cannot. And this year’s open house was particularly successful at that. Finding its theme from the Lao Tzu quote, “A journey of a thousand miles begins with a single step,” guests had the opportunity to see Mentoring Plus through the eyes of the teens we serve. Starting by meeting a family who was relatively new to the Mentoring Plus, guests toured the building while meeting with more families and staff, each in a different stage of their journey through the program. What’s it like during the first couple of weeks attending M+? How does the curriculum develop and change over time? What role does the life coach/mentor play? How does our organization go beyond the teen, to serve the families? What changes, external and internal, have taken place in the youth and the family as a result of their participation? All of these questions and more were answered during the tour. One of the greatest differences between Mentoring Plus and other organizations is the long-term commitment we make to our kids. It’s not unusual for a teenager to remain in the program for two or three years. Just think about how different your life was three years ago. Then try to remember the changes you experienced over the three years from ages 14 to 17. Kids go through massive changes during their teenage years, and these kids are particularly vulnerable to challenges and disadvantages during that time. So, getting the chance to hear from these young men and women as they share the stories of their own personal journeys through the program is often heart-breaking and inspiring. You could really see the journey of a thousand miles, and how each step along the way was significant. As guests continued through the open house, they met with volunteers and staff who explained in greater detail how to contribute to the organization’s success. This helped our visitors to get a deeper understanding of the broad range of our services, and to see how they might put their own skills to use for us. 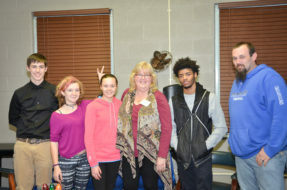 They were able to meet with Program Director, Robin Anderson, as well as our new Executive Director, Chris Saunders. Several board members were also in attendance. We also had two special guests, Ed Davis and Audrey Ann, who documented the entire event in photos. Be sure to Like us on Facebook to see all of the great moments they captured. Again, Mentoring Plus wishes to thank everyone who was able to attend our Open House and express our deep gratitude to those who donated to our #GivingTuesday fundraiser. Thank you! One of the things that sets Mentoring Plus apart from our peer organizations, is our long-term dedication to the teens we serve. Every young person admitted into our program commits to staying with us for at least one year. Just as important, we commit to be with them for a year. At the heart of the program is the one-on-one relationship between that young person and their life coach. The teen and mentor meet once a week at the M+ building where they have dinner and follow the program curriculum. It’s usually a light, enjoyable evening for everyone involved, and allows the two principles to hang out and have fun in a relaxed (yet, structured) environment. Over time, however, that relationship becomes more and more important to the youth’s success–not just in the program, but in life. Theirs’ is a lifestyle that looks more like survival. Living a life with more roadblocks than roads, these teens are growing up in circumstances that are unimaginably difficult. While most people might thrive when given the right support, these youngsters have no support. In fact, the places that you might turn in times of crisis — your family and friends — are the very places that these teens find the most hurdles. Often, it is those places of supposed comfort that someone in our program finds the most distress. And that is why the mentor is so important. The mentor stands like a lighthouse among crashing waves; a beacon of stability and guidance in the most trying situations. The mentor provides a singular source of trust, hope, vulnerability, and eventually love. If the teens are the reason that this organization exists, then our mentors are our greatest asset. And if this program is to have any success, it is because of the relationships that are built between the teens and their life coaches. In anonymous surveys taken by the teens in our program over the last twelve months, 95% said that their mentor helped them to feel good about themselves. 95% also either agreed or strongly agreed that their mentor helped them to challenge themselves, and 95% said that they could look to their mentor for guidance. Those numbers aren’t just impressive, they’re important! In the same survey, 55% of the teens felt respected by their parents, and only 45% felt that their parents even tried to understand them. This demonstrates the important role that these mentors play in the teens’ lives. This is where we need your help. Currently, our organization is operating at just over 80% capacity. Ideally, we want to run at 100%, helping as many teens and families as possible. But admitting more youth requires that we have the volunteers to support them. The position of life coach is perhaps the most challenging volunteer role available, but it is certainly the most rewarding. Just as each teen admitted to the program agrees to participate for a full year, the lifecoach is asked to match that commitment. As mentioned before, the mentor/mentee pair attend the program once per week. They go through the planned curriculum together, building trust and developing mutual respect. Outside of the program visits, the two may meet up from time to time, or communicate more often on phone, text, or social media. And as the relationship grows we begin to see real changes in the youth. November is National Inspiring Roles Models Month. Yes, that’s really a thing, and it’s going on right now. So think about who inspired you. Think about how you can inspire others. And consider becoming an inspiration to the people who need it the most. To learn more about becoming a life coach or other volunteering opportunities, contact Laura at laura@mentoringplus.org or 859-462-4152. These are the words used by others to describe who our mentors really are. You would never know it walking past them on the street. They are the most unassuming of rock stars, the humblest of superheroes. Say “thank you,” and most of them smile sheepishly, and insist that your gratitude is unnecessary. They are humbly embarassed by our acknowledgements, and yet, it is that very same modesty that demands such recognition in the first place. They turn up every single week, after long days at work, and continue to give their time and love to our teens. And after years and months of hard work, hours upon hours of patience, they want no recognition for it. They mentor because it is the most natural thing in the world to them – to give, to love, to fulfill a need – and they require no thanks in return. Since we know they won’t take credit for any of it, we can only hope they know what a difference they have made in the lives and futures of so many young people. So, perhaps in vain, we extend our thanks to our mentors, who continue to dedicate themselves with such constancy and humility to the kids who need them the most.